Abundant money goes to financial engineering, rather than investment. The U.S. economy reported a 1.9% drop in productivity in the first quarter of the year, underscoring the trend of historically slow productivity growth in the current recovery. The slowdown isn’t entirely understood, but one certain cause is slower than usual business investment. 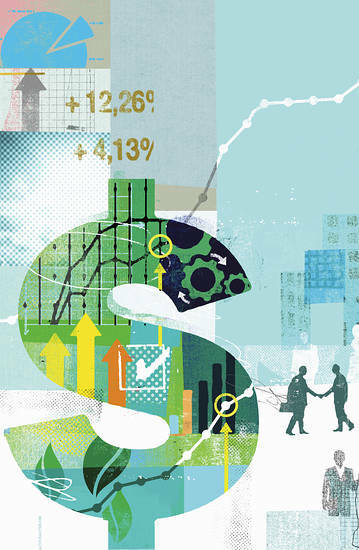 Money that could go to wealth-creating innovations is going instead to financial deal-making. Companies have announced more than $1.3 trillion of mergers and acquisitions world-wide so far this year, a surge of 23% from the same period last year and the most since the financial crisis. It’s not irrational exuberance that’s driving many of today’s deals—just the opposite. With fewer opportunities for growth but plenty of credit available to fund deals, mergers are often the most sensible way for a company to expand. Around the world, it’s the era of easy money, hard regulation and slow growth. Central banks have made dollars, euros and yen plentiful, but central governments have restrained businesses from putting that money to its most efficient use. Why take a chance trying to create a new product—and persuading the world’s bureaucracies to tolerate it—when you can buy an existing one? In the U.S., the combination of loose monetary policy and restrictive government has created one of the great ironies of the Obama era. The labor-force participation rate of 62.7% persists at a 1978 level, and Americans who have jobs see little wage growth. But it’s a boom time for the Wall Streeters Mr. Obama vilifies, especially the attorneys and financiers who arrange corporate mergers. It is the story of this era. The Kauffman Foundation, which tracks new businesses, says its data show 2013 was “the second consecutive year to show an entrepreneurial activity decline in the United States.” Being an entrepreneur always takes guts. It takes special courage during an Administration that has twice set the annual record by issuing more than 81,000 pages of regulations. But you wouldn’t know the challenges of the overall economy by observing the financial economy. The boom in corporate mergers has investment banks reporting surging advisory revenue. Dealogic reports that, world-wide, markets posted the best first quarter ever for equity capital deals, with initial public offerings, secondary stock sales and convertible bond offerings up 27% from the same period last year. Corporate debt issuance remains robust. What are companies doing with all the money they raise? Not necessarily funding future prosperity. A recent note from Strategas Research Partners points out that much of the money flowing into companies in recent years was directed to “financial, rather than economic, risk-taking.” Strategas says that as of the end of last year the dollar volume of stock buybacks had soared 287% since the post-crisis low and the value of mergers and acquisitions was up 179%. Senator Elizabeth Warren and others on the left want to blame all this on the companies. But what she doesn’t understand is that this is a perfectly rational market response to the sheer weight of the Obama regulatory apparatus that punishes innovation and risk-taking. The progressive urge is to command businesses to make more investments, but if there’s an opportunity, no one needs to be commanded to exploit it. Washington simply needs to allow it. Capital expenditures support business expansion. In the U.S. they shrank in the first quarter by 3.4%, according to the Commerce Department’s measure of nonresidential private fixed investment. Such investment is needed not only to create new productive capacity, but to replace assets that are worn-out and obsolete. A separate Commerce measure, tracking net investment—meaning new investment minus the capital assets that are consumed—shows that even in an era of easy money, American businesses aren’t eager to spend on expansion. Commerce has data through 2013 for this statistic. And in constant dollars, over the first five years of the Obama Administration net private nonresidential fixed investment was the lowest since the mid-1990s when the economy was much smaller. Even near-zero interest rates haven’t been able to offset ObamaCare, Dodd-Frank, new EPA emissions rules, the highest corporate tax rate in the developed world, and myriad other threats from Washington. This White House has offered an abundance of taxpayer-funded stimulus plans. But the only true and lasting economic stimulus is one that gives people a reason to invest their own money. That will require a sharp reduction in the regulatory and tax burden that continues to inhibit business activity. Workers far from Wall Street desperately need relief.